Apple Is About to Update Macs and iPads. Do You Care? Marcio Jose Sanchez/APThis is the iPad that Apple introduced a year ago. What will be different about the next model that might make more consumers want to buy it? The new iPad is coming. Apple has a media event scheduled for Oct. 16, and it's widely expected to update several product lines -- including its iconic tablet. Now Apple (AAPL) just needs to get the public to care. The iPhone 6 and iPhone 6 Plus that arrived last month will hold the market for another year. Apple watchers are bracing for new Macs and iPads. A couple of years ago, it was Apple's legacy computer business that was giving the tech giant fits. The mobile computing revolution was in full swing, and Apple's iPhone and iPad lines were growing at the expense of its Macs and MacBooks. The iPhone is still going strong, but now it's Apple's computer business that seems to be growing as the iPad is retreating. 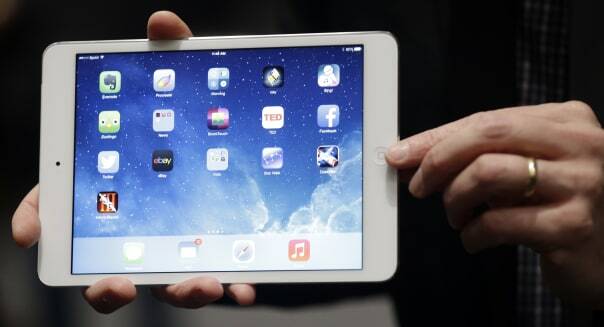 "We're expecting new versions of the iPad Air and the iPad mini," Apple fan website 9to5Mac is reporting. "The new Air will be slightly thinner, but come with a more efficient (and slightly snappier) A8 processor, new M8 chip from the iPhone 6, Touch ID, enhanced camera features, an improved screen design, and, of course, a gold color option. It's likely that the new Mini will pick up some (if not all) of the Air's new features." We'll know for sure come Thursday, but will that be enough? That we'll see improvements to the iPad is no surprise. Apple always seems to be raising the bar by sprucing up the iPad with slick features that rivals are either already employing or (more often than not) will eventually start offering. However, the annual ritual of improving on its game-changing tablet doesn't appear to be enough these days. When Apple sold 16 percent fewer iPads during its fiscal second quarter -- the three months ending in March of this year -- than it did during the same period a year earlier, it blamed part of the weakness on retailers having too many iPads left over from the holiday shopping season. That was pretty alarming in and of itself, but when Apple followed that up with a 9 percent year-over-year decline in iPad unit sales during its fiscal third quarter, it was no longer a fluke. It may just be back-to-back quarters of year-over-year declines after more than three years of steady growth, but that's enough to start a worrisome trend in the fast-moving realm of consumer tech. The next few days will be critical for the iPad. Four days after Apple hosts its media event, it will report quarterly results. If the iPad sales clock in lower for a third consecutive period, there's going to be a lot of pressure on the new tablets to turn things around and reignite buzz and sales. Making matters worse, sales growth for other tablets has slowed, but they're not shrinking in popularity. Industry tracker IDC's gauge of shipping activity reported an 11 percent year-over-year increase in tablet shipments worldwide during the three months ending in June. There are plenty of reasons for the iPad's slump. Unlike with the iPhone, wireless carriers don't typically subsidize tablets to shave hundreds of dollars off the hardware price in exchange for a two-year contract. Laptops and netbooks are getting cheaper and lighter, giving potential tablet buyers more alternatives that come with convenient attached keyboards. There also isn't much of an incentive to upgrade every year or two the way that folks do with their smartphones. Apps are apps. Another possible explanation for tablets in general fading in popularity is that smartphones are getting bigger. Do you really need an iPad mini if you buy the new iPhone 6 Plus? That's one more question for Apple investors and tech watchers to weigh as we head toward two very important dates for the tastemaker of tech. Motley Fool contributor Rick Munarriz has no position in any stocks mentioned. The Motley Fool recommends and owns shares of Apple. Try any of our Foolish newsletter services free for 30 days. Check outour free report on the Apple Watchto learn where the real money is to be made for early investors.